The Fresh Pressery Cafe in Koramangala has a couple of new menu additions for the summer. From luscious breakfast smoothie bowls to whole wheat pasta — all healthy of course. We visited the cafe in Koramangala and discovered that this is more of the cafe’s kitchen and pick up point rather than a full fledged cafe situation. So expect basic chairs and tables, and a couple of sofas. There is no air conditioning folks, just a fan spewing some cool moisture laden breeze and we think the space needs some sprucing up. Fresh Pressery folks, we are in love with your cafe on Walton Road. Let’s have some of that charm at your Koramangala location too. But what the space lacks, the menu more than makes up for it. We have already raved about Fresh Pressery’s food here. From the new menu additions, we first picked the Breakfast Smoothie Bowl — made with yoghurt, spinach, avocado, spirulina, skimmed milk, and honey, and topped with strawberries, bananas, crunchy and chocolate granola. This was really delicious. Though we would have preferred it slightly more chilled, but we can imagine eating this for an early morning brekkie. The smoothie bowl also made for a super pretty picture. Up next was the beetroot, goat cheese and quinoa salad with a perky lemon and peppery dressing. What elevated this salad to the next level was the addition of sugar glazed walnuts that added a nice crunch to the dish. This salad could also be a meal by itself thanks to the filling quinoa. For mains, we tried a whole wheat pasta tossed up with sun dried tomatoes, veggies, olives and more. You can choose to add chicken or prawn to this dish. No typical white or red sauces drowning the pasta, instead this was in the aglio olio style, a style I personally love. The paprika added a nice punch to the pasta. The grilled chicken breast with sun dried tomatoes was equally nice, and came with a nice creamy sauce and side of mushrooms and salad. Don’t we love a place that can make you delicious tasting desserts but with healthier ingredients or alternatives. 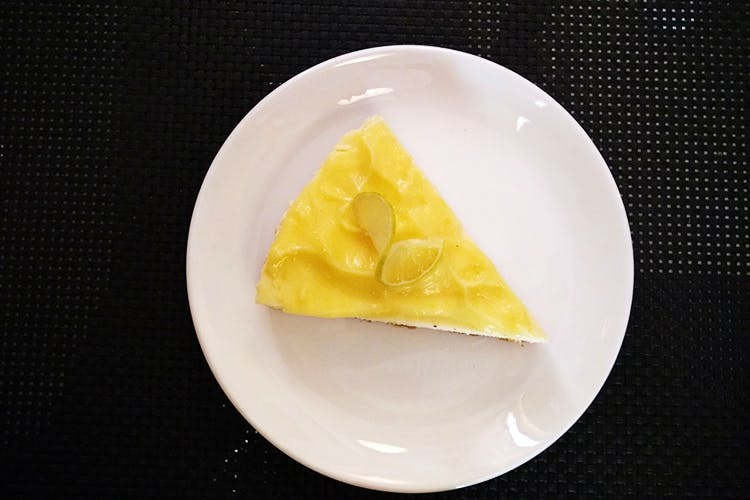 You have to try the Low Fat Lemon Cheesecake, topped with gooey lemon curd, the cheesecake came with a nice salty, crumbly base. It wasn’t cloyingly sweet either and tasted of fresh lemons. Yum! The other dessert is my favourite, the dark chocolate quinoa cake sweetened with coconut sugar. This is for those who love dark chocolate! What we like about the Fresh Pressery Cafe menu is that everything is reasonably healthy but also tasty. Nothing tastes like soulless health food here. And we are glad. Now if only the cafe interiors went through a bit of an overhaul, we would be happy. Fresh Pressery Cafe is soon going to start a lunch subscription service, where you can sign up for a week’s worth of juice and salad combos. They are also on Swiggy and deliver breakfast jars in Koramangala and Indiranagar.